Fondazione Prada presents the exhibition “Uneasy Dancer”, a comprehensive survey of work by Betye Saar. Curated by Elvira Dyangani Ose, “Betye Saar: Uneasy Dancer” is the first exhibition of the American artist in Italy, and brings together over 80 works including installations, assemblages, collages and sculptures produced between 1966 and 2016. Through her confident usage of found objects, personal memorabilia and derogatory images that evoke denied or distorted narratives, Saar developed a powerful social critique that challenges racial and sexist stereotypes deeply rooted in American culture. 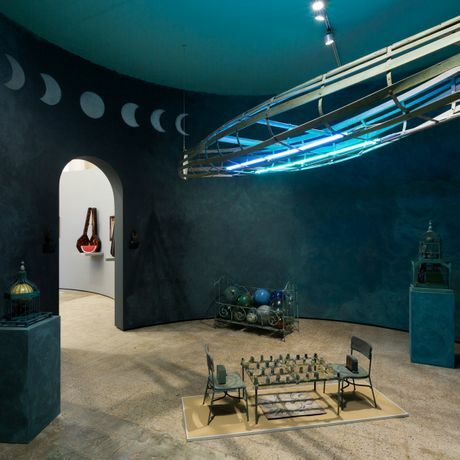 In the 1970s, her assemblages began to grow in scale, ultimately becoming substantial installations and immersive environments that speak to an approach uniting spiritual beliefs and faiths of all kind – from the intimate and the mysterious to the universal – alongside politicized convictions. “Uneasy Dancer” expands holistically on fundamental tenants of Saar’s practice including memory, mysticism and the construction of socio-political identifiers. This is none so much apparent than in the seminal work The Alpha and the Omega (2013–2016), a circular environment alluding to the initiatory journey and the experience of human life. This installation was specifically conceived for “Uneasy Dancer”, and will include a number of newly created elements denoting the idea of representing the whole of anything, from beginning to end. Earlier assemblages involving objects inserted within boxes or suitcases, like Record for Hattie (1975) and Calling Card (1976), take on a performative dimension even when rendered in an intimate scale. Sculptural floor works utilizing cages, such as Domestic Life (2007) and Rhythm and Blues (2010), simultaneously represent the physical and metaphorical condition of segregation, and the increased need for resistance and survival. These works specifically reference African-American folklore, combining a political dimension with a spiritual vision that draws on a multiplicity of traditions stemming from Africa, Asia, America and Europe. The exhibition additionally highlights a series utilizing work tools and elements of domestic life, such as washboards and scales, alongside either found or inherited photographs, as in the works Mystic Window for Leo (1966), The Phrenologer’s Window (1966) and A Call to Arms (1997). Spanning the length of several decades, these aforementioned works reveal, on one hand, an intimate and autobiographical condition, whilst on the other, allude to an imaginative, fantastical dimension. Saar’s use of photography, treated here as a found object rather than a singular flatness, in works such as Migration: Africa to America I (2006) becomes a way to celebrate both the beauty and artifices of femininity. Throughout her career Saar has engaged with a practice which, in addition to opposing male chauvinist and Euro-centric thinking, supports a humanistic perspective that reconsiders notions of the individual, family, community and society.